My last name Popović contains a character ć (a c with an acute accent on top) that is a cause for many misspellings. This page is created as a guide on how write Popović in different text-editors and typesetting systems. You may have to scroll down the list of available symbols. Some fonts might not have these Extended Latin characters. 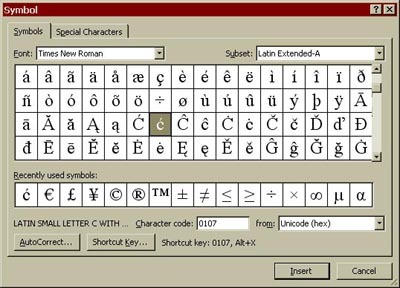 Times-New-Roman, Arial are just two of many Unicode fonts that contain this character. Type Popovi and then while holding Alt key press 2 6 3 on the numeric keypad, then release Alt key. Pressing numeric keys on the main keyboard (the keys above the letters) will not work, you have to use the numeric keypad. 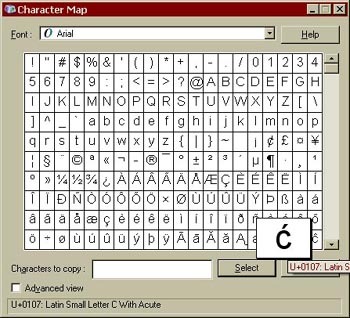 On Windows you can also start the charmap application and cut and paste the appropriate letter into your document. charmap exists on all Windows varieties.